My wife surprised me on Thursday. 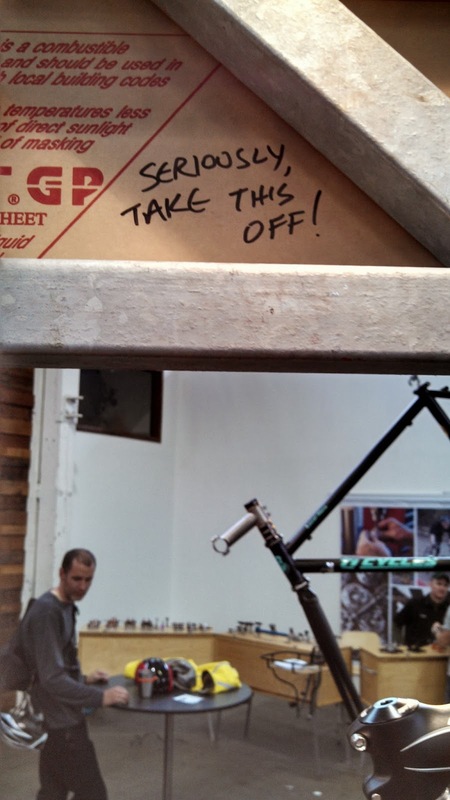 A while back I had thrown out the idea of going to the Oregon Handmade Bicycle Show in Portland this weekend. Problem was, with the little one, plus having my older daughter (12 year old) this weekend, I didn't think it was the best idea. Well, on Thursday she suggested that I take my older daughter on a road trip and do the show. We talked about it. Negotiated... I also have a first-cousin-once-removed who just had a baby in July and lives in Portland, and she and my wife have struck up a bit of a friendship over the last year. A visit with her and her son sealed the deal, and we all took the drive south yesterday morning. The drive itself was harrowing -- Biblical-flood-like rains falling made the highway speeds slow, with visibility dancing between poor to downright dangerous. But we made it just fine. A stop at the Lighthouse Inn in Linnton for a lunch of burgers and onion rings (the best I've ever had, worth the side trip), then back into town. 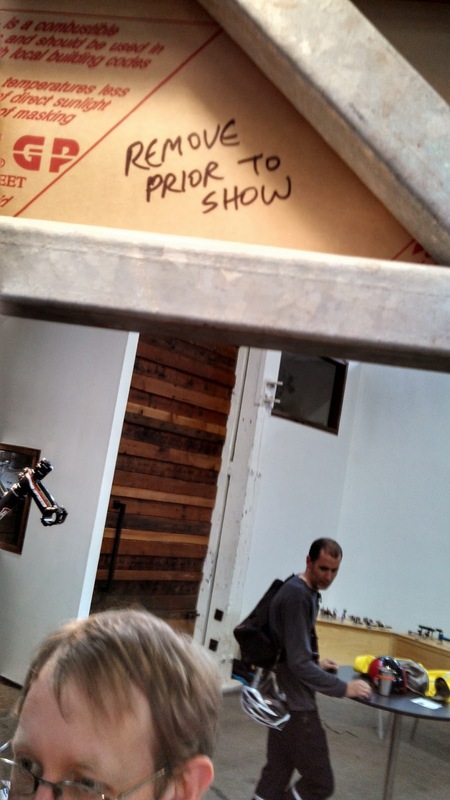 I was dropped off at the show, while they headed to Powell Books. I've been getting my welding gear together since March, when I took a 3-day one-on-one session with Dave Levy of Ti Cycles to build my gravel bike (the best-riding bike I've ever been on), and want to be building bikes by the end of the year, so seeing nothing but hand-made bikes and talking with the builders on various topics could easily fill the better part of an afternoon. I would consider it research. And maybe a little bit of obsession. I found myself looking less at the bikes, and more at the details of construction and design. 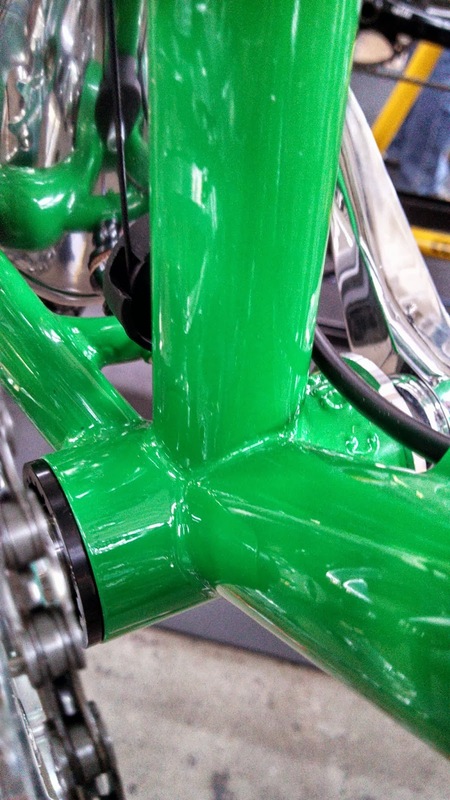 The "signature" parts, the things that, even if the frame were repainted without logos, some one could look at and say, "Hey, I know who made that bike." 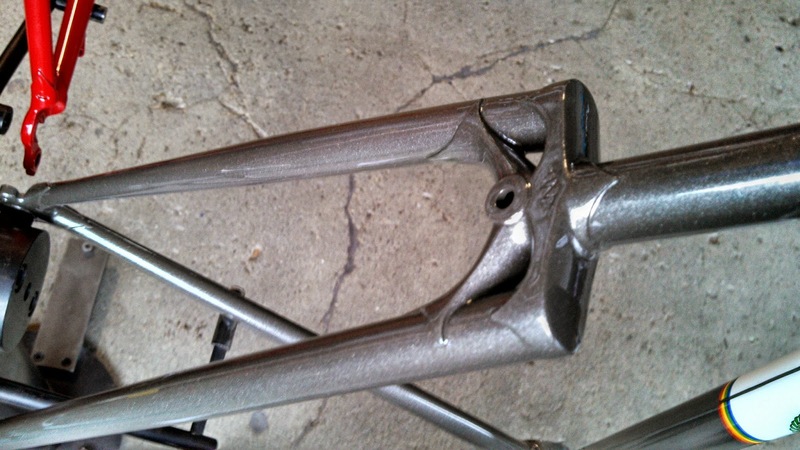 * Ti Cycles is now offering smoothed welds on their titanium frames. I know how much hand work it takes to finish a fillet brazed frame (I think 2.5 of the three days building my bike was finishing the joints), I can't imagine doing that on Ti. They were beautiful. 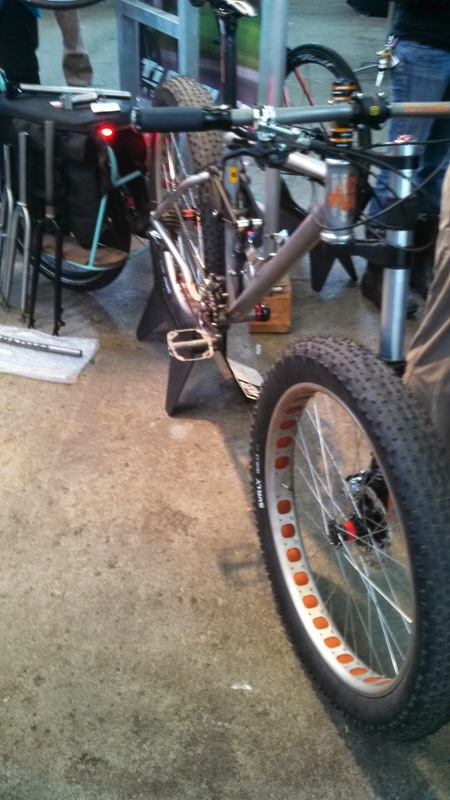 * Ti Cycles also had a full-suspension fat bike, and the rear suspension had no rear pivot -- it relies on the flex of a titanium plate aft of the bottom bracket. 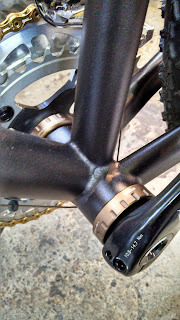 * Pioneer Bicycle Co, a new builder, had some beautiful and smooth brazing. Talking with the owner, I found out he's pretty new -- he's only been building since January. Hm... Maybe I could be there next year. Only I don't live in Oregon. 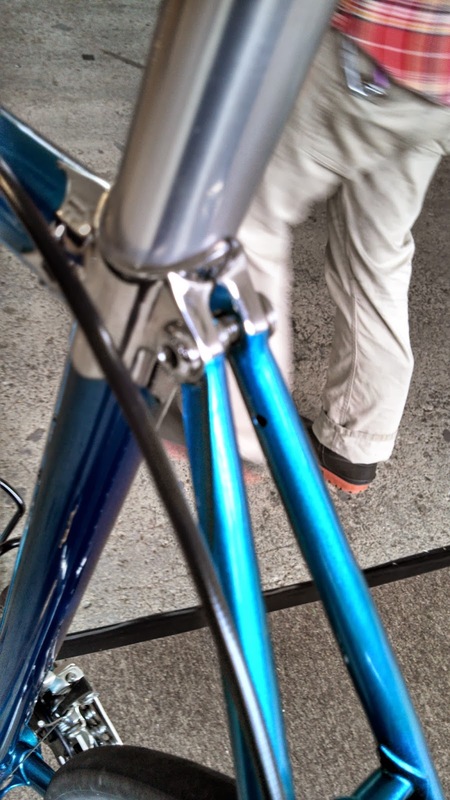 * Strawberry Bicycle had some interesting wishbone stay work on display, and I really liked the Lan71 lug. Also, Andy Newlands brazes with propane, so I picked his brain a bit on set-ups and processes. * Vendetta had a unique treatment on their seatstays -- a fastback design that is also capped like many wrapped stays. * Igleheart had some of the tightest brazes I've ever seen. Very clean. * Contes Engineering's 4-wheeled bike looked like it could go ANYwhere. 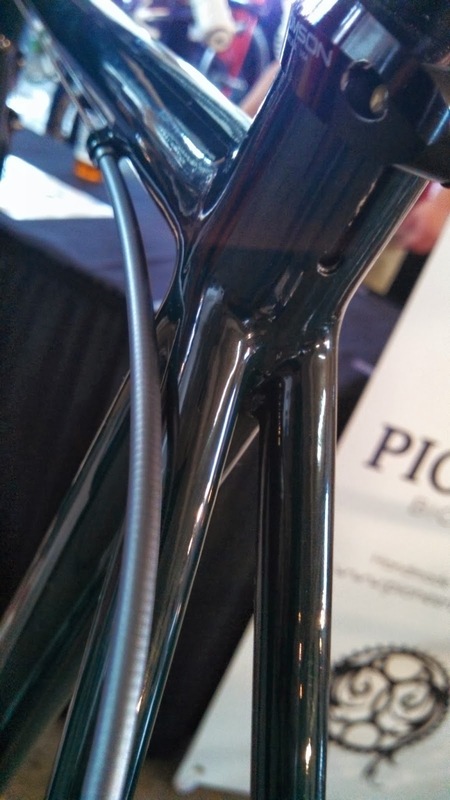 * Cielo Bikes had a road bike on display where the welds and paint made it look like liquid metal. Beautiful. * Cielo also had a really nice disc cross race bike on display. 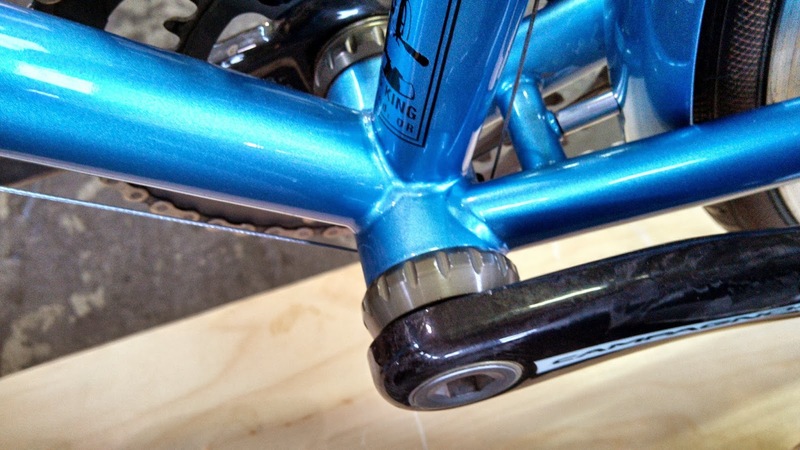 * Winter Bicycles had a matte-finished cross bike with un-finished brazes. 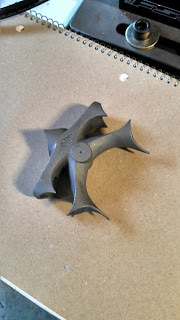 These things were so clean they didn't need any finish work. 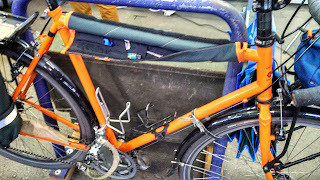 * North St had an ingenious tool bag that was also a top tube pad, which they called the Salmon Roll. 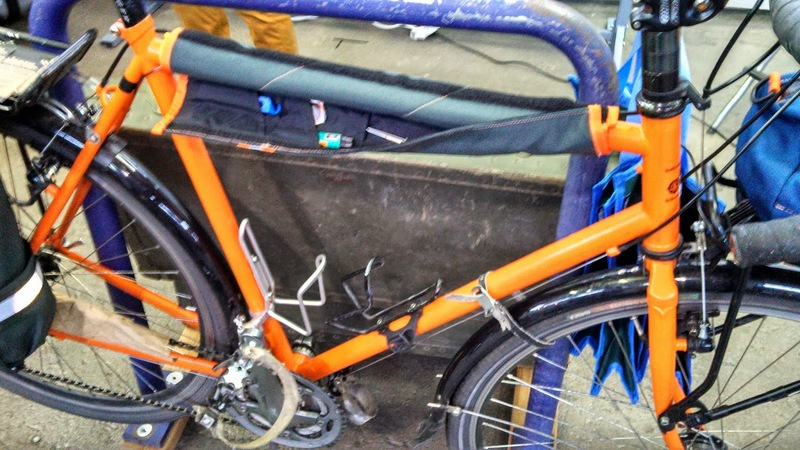 For any bike that doesn't have top tube cables, this would be an awesome way to carry the tools. 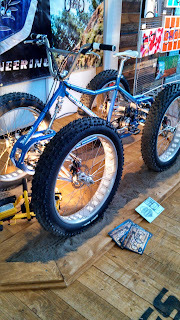 Ti Cycles' FS fat bike. There were also a couple of vendor booths that left me wondering just what they were doing there. Finish work was poorly done, brazes were sloppy, and in one case not only were the bikes dirty and beaten, but the person manning the booth was clearly drunk. To be fair, beer was being served (though not free), and many were partaking. But it was a great time. I learned some things, learned that I need to learn a lot more, and left richer for the experience. Another drive through torrential downpours (I think I saw animals lining up by two's in Olympia) got us home late, ready for a long sleep. 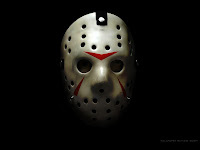 ...something wicked this way comes. Well, it's not coming. Yet. But it could. Last year, on the last day of the Georgia state legislative session, HB 689 was introduced. This is nothing more than an anti-cycling rewrite of the licensing and traffic code. Now this isn't the first time that licensing of bicycles has been proposed, and I'm not really opposed to the idea. It might help deter bike theft, and in some kind of dream world might even help with theft recovery. In a truly dream-induced state of lunacy, it might even tilt motorists to a feeling of one-ness with cyclists, or at least apathy rather than outright hostility. Anyway, as I said, I'm not opposed to registering and licensing bikes. But... As it's written, is it anything more than a state-sponsored money-grab? An annual license fee, along with transfer fees when a bike is sold or even given away? In Washington, when a used motor vehicle is sold, the state gets to charge SALES TAX on the PRIVATE sale! And how do they do this? Well, you have to transfer the title. They'll hold it until the tax is paid. And what if the vehicle is GIVEN away? They'll charge the tax based on the Kelly Blue Book value instead of the sales price. They will even check the actual sales price against Blue Book, and if it's too far out of line, guess what -- KBB value regardless. You think Georgia would pass up something like that? Now let's get to the real anti-bike portion of this legislative proposal. Check out page 6. So, did you get that? Pacelines? Things of the past. Can't draft, and if you do, you can't drop back from the front (you'd me more than single file), and can't have more than 4 per line. So much for the centuries and charity rides, unless they're all staged on bike-only roads, or pay yet another fee for a special permit. Here's another gem on the same page. (e) When a roadway is part of the state highway system, the Department of Transportation may restrict persons from riding bicycles on the roadway or designate certain times when bicycle riding is permissible. When a roadway is part of a local road system, a local governing authority may restrict persons from riding bicycles on the roadway or designate certain times when bicycle riding is permissible. Ever read the comments on any cycling-related accident article online? They all include comments to the effect that bikes shouldn't be on "their" roads, and if they get hit, they deserve it. If faced with complaints from constituents, what do you think local politicians are going to do? Yep, close the local roads to cycling. Open times? Sure. And I've got a bridge to sell, cheap. It amounts to nothing more than open-season on cycling rights. The second amendment was written all about keeping government from over-running the people. Our government is supposed to be by the people and for the people. Our rights as cyclists are being threatened constantly because we ride on "their" roads. Do I think this legislation will pass? Not really. But the fact that it was even proposed troubles me. It's one more high-lob against bikes, and if it takes a foothold anywhere, I can see other states adopting similar anti-bike revisions just due to the money-grab aspect. We need to be vigilant. It's amazing the things that cross one's mind during long training sessions. I started off this epic at 8:30 at Five Mile Lake, which I'm very familiar with and where I've done most of my open water swim workouts. The fog was just at the top of the trees as I waded out into the water. Driving to the lake I had envisioned being socked in at the center of the water... "MARCO!" I quickly settled into a sustainable rhythm, relaxed, just ticking off the yards.Several times my goggles played tricks on me, making me think I was seeing blue skies opening up along the horizon. Nope. But it was just the water on the lens coupled with some color distortion from the light tint. By the end of my first lap (of three) I could feel a spot on the back of my neck feeling hot. Uh oh. 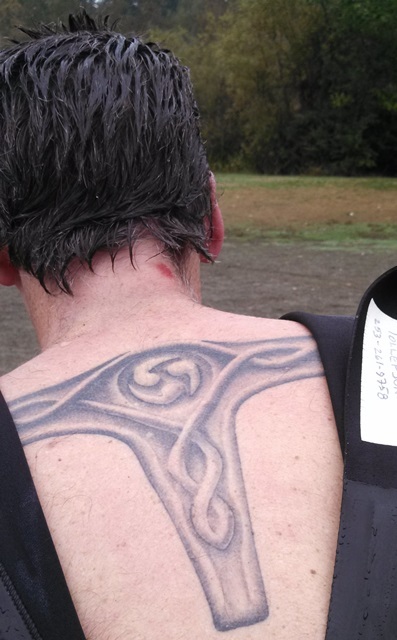 Wetsuit hickey! 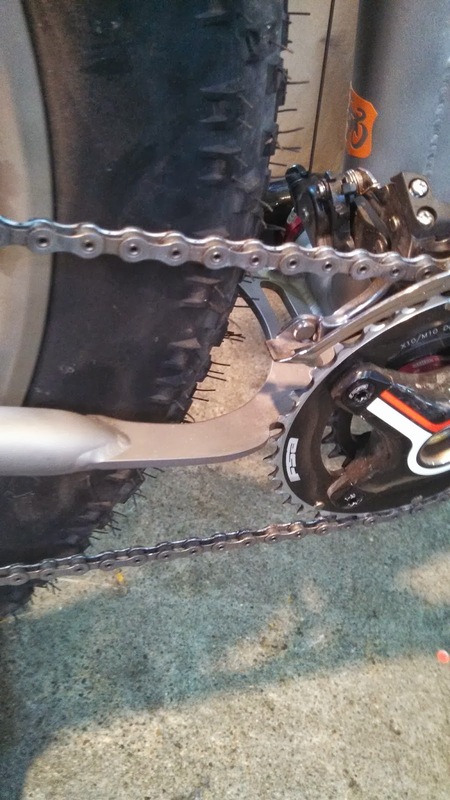 Lesson learned: When you think you've applied enough Bodyglide, put on a little more. Nothing to do for it at that point but just to keep going. My mind wandered, Things I don't even remember, some I do -- like thinking it would be good to have a waterproof dict-a-phone so I could capture these fleeting thoughts... I knew I wouldn't remember them all. My pace was steady through the first two laps, but my speed dropped on the third, adding a couple minutes to my expected time. I also remember thinking that it's good to be able to pop off an Ironman distance swim on almost no swim training. 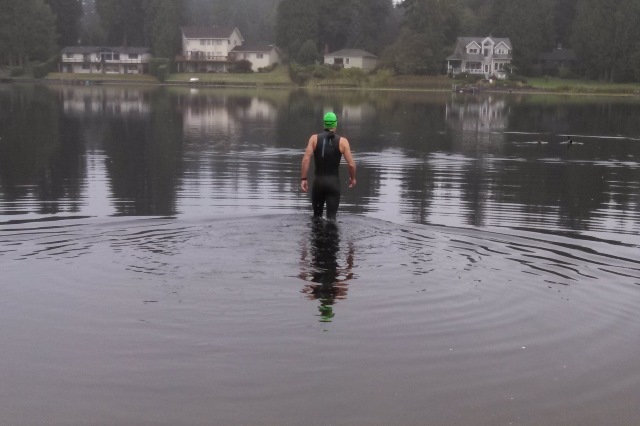 I took my time with the transition from swim to bike. Full clothing change, making sure my feet were clean, walking to the car and getting the bike together and all my gear and food in my jersey pockets. My wife clicking off a couple pictures as I pedaled off into the slight mist. I've said many times that your body essentially forgets the swim by the time you're on the bike for a couple miles. And for the most part that's true. But with such a long swim, you've dipped into your energy systems already and need to start refilling the tank almost immediately. I kept pulling on the water bottle, and was eating by 5 miles. 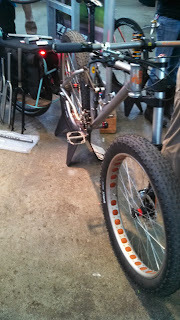 I'd put my lighter wheels for the day, wheels which I haven't ridden on since RAMROD last year. They do behave a little differently than the bomb-proof wheels and wide tires I ride on most days. 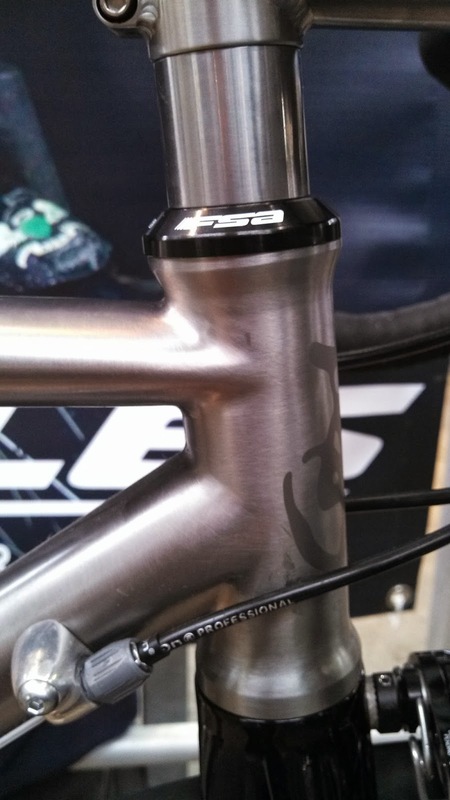 The bike felt like a completely different animal, more lively, more responsive. Not in a bad way, but it took a few miles to settle into the feeling. 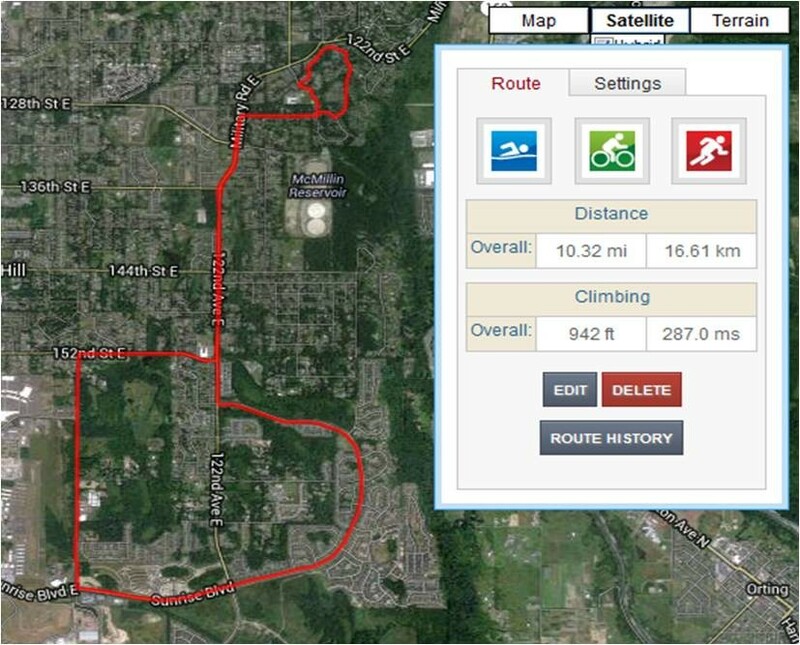 My chosen route was a double loop so that I could stop by home to refill water bottles, restock food, and take a little break. Add a PB&J, and in 15 minutes or so, I was back on the road for the second half of the ride. There's a pug along the route that will come out and chase me. Oh, and it's on an uphill section of this route. And he's pretty fast, staying up with me into the low 20's for at least a little while. Usually it's not such a big deal to just jump out of the saddle and get past him. But I haven't seen him in a while. I thought maybe he'd moved, or been hit by a car. Well, he's fine and in full-speed health. On my first lap he ran out as normal, and I got past. But on the second lap he must have heard me early, because he ran out well before I even got to that house. And he brought a friend. I didn't want to sprint again, because I didn't want to dig into that well with so far to go still, so I just stopped -- "Dude, REALLY?!?! I'm not in the mood. Go home." He didn't know what to do. He just stared at me. I started out again slowly, and he let me go. The last bank-reader-board temperature I saw said 64 degrees. And it was still cloudy with occasional mist dropping on me. So much for the nice weather forecast of 80! I'll admit that I did a little bit of chasing a round-number average speed on the bike, and finished at 18.0 mph for the rolling average. Another easy transition at home, putting the bike away, another full wardrobe change, and I set out to the cheers of my wife and daughter. On the run, I was starting tired, but still feeling pretty good. Smiling, at least. I kept my stride even and easy, not pushing hard with the calves (I've had issues with my calves running off the bike before). 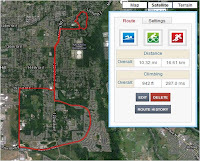 I ran the first two-plus miles non-stop, then started taking some walk breaks. Even then, I was running more than not. 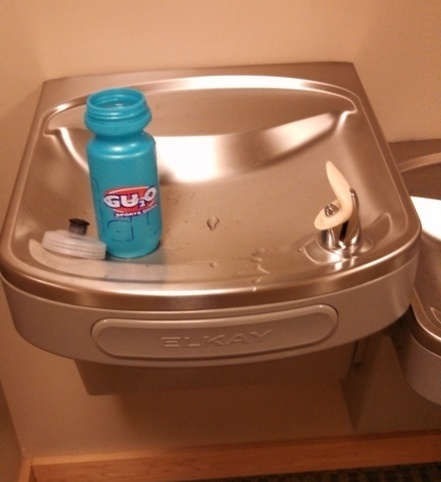 Coming to the half-way point, my water bottle was near empty, so I stopped at the medical center there and refilled. 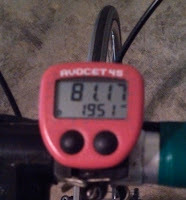 Later, I figured out that it was past the half-way point, and when I got to eight miles, it kind of crept up on me. As tired as I was, though, when I put an intermediate goal of "run to that fence/telephone pole/fire hydrant, I didn't walk until I reached it. THAT is a victory. The final hill just short of my house was a sweet success. And I walked into the driveway with the only fanfare playing in my head, no cheering crowds, no finish banner, no volunteer kids draping a finisher's medal around my neck. 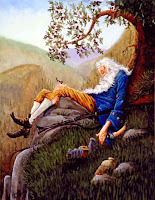 In the end, I was very tired, but not so exhausted that I couldn't keep moving. And of course with having started out with the IM distance swim, and the overall effort being longer than a half-Ironman, there is the thought that maybe, with some more training, I could possibly do a full Ironman distance event. I mean, I did the swim with basically no swim training. Could I add another 31 miles to the bike leg? Sure. 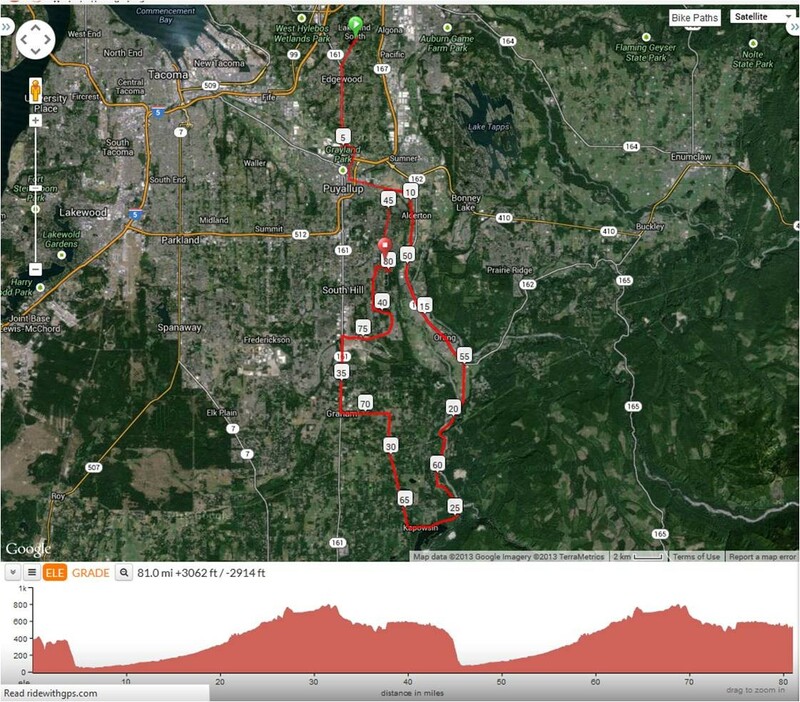 Could I add another 16 miles to the run? Uh... no. And I'm okay with that. 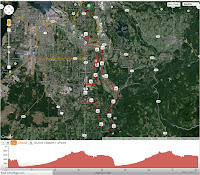 Could I decrease the swim by 50%, the bike by 25 miles, and add 3 to the run? Sure. But then again, I don't really want to. I'm quite happy with the longer rides and shorter runs. I had done what I set out to do, a challenge I'd laid out for myself almost a year ago. I never geared my training for this day, I just wanted to throw myself at the distance with whatever I had from my daily regimen. 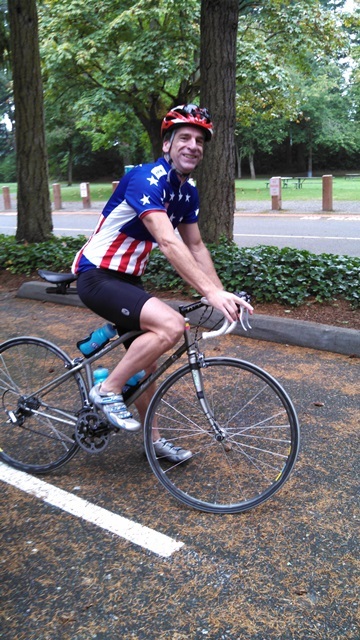 Saturday morning I went to the Inspired Ride Bicycles for the weekly group ride. The shop owner asked me why I did this personal triathlon. I've determined that, for any one asking that question, no answer will satisfy them. It's something that you kind of either understand or don't. For those that do, they don't need to ask. So what was the day about? A large bit of self-affirmation, a piece of meeting a challenge I knew I wasn't fully prepared for, and a healthy dose of gut-check. Besides, as mid-life crises go, putting in a long day isn't so bad. 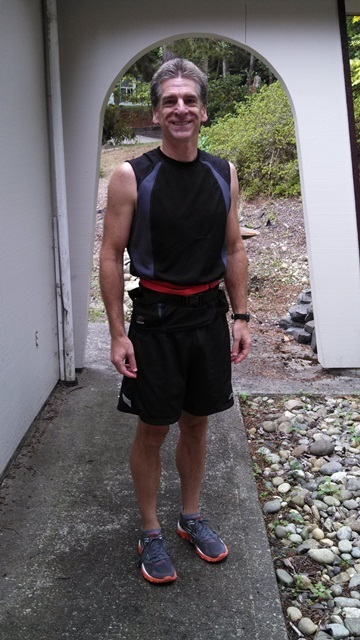 About a year ago, just after I passed my final 40-something birthday, I put out a challenge to myself. A sprint tri for every decade. 750m swim, 15 mile bike, and 5K run, times five. Comes out to a 2.4 mile swim, and I fiddled with the distances (moving some miles from the run to the bike) to get to an 81 mile bike ride, and a 10 mile run. Overall, a fair bit more than a half-Ironman triathlon. My plan was to do this on one of the days over a long weekend near my birthday, which just happens to be next Thursday. 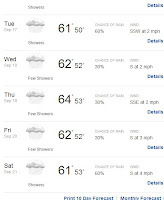 I've been watching the weather forecasts, and while that particular day looks decent, it's only one day in the middle of a week-long cloudy-with-a-high-chance-of-deluge. 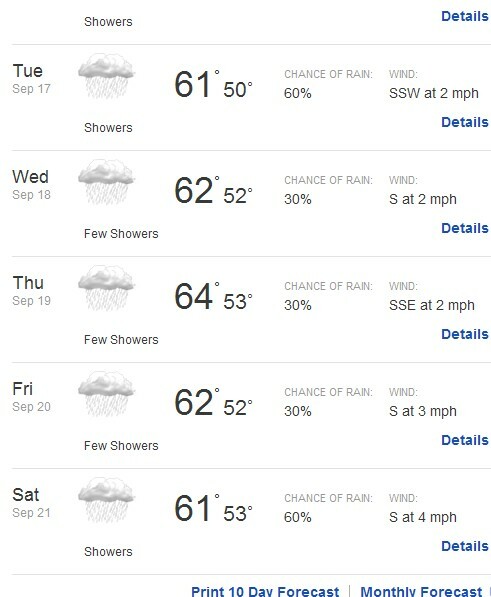 And this IS the Pacific Northwest, which usually means that the one nice day will crap out nicely when it arrives. 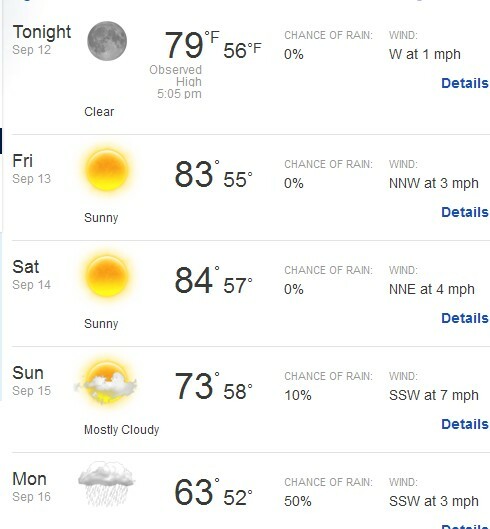 But the weather THIS week is fantastic. It hit 90 yesterday, which is really warm. 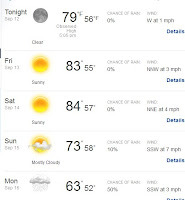 Not just really warm for this area, but really, REALLY warm for the middle of September. So yesterday my wife suggested that I do the long tri day on Friday. Well now... Since I already have the day off work due to a flexed schedule, I figured, why not? But wait, it's Friday the 13th! I'm professing it now -- it's going to be a very lucky day. This isn't a race, or even a fast training day. It'll be a long haul*. Stops for food are okay. I'm sure there will be at least one. And then I'll be able to settle in for the long winter's nap. Or at least long enough to wake up for the party on Saturday. * Note: I haven't trained for any long distances for swim or run. This should be interesting.